Fused Silica Foam-50 (2500ºF+ Low Expansion 50 pcf Insulating Foam Block) - Foundry Service & Supplies, Inc.
Fused Silica Foam-50 is characterized by a uniform open cell structure with excellent thermal insulating properties, exceptional resistance to thermal shock, and volume stability over a wide temperature range. The material is capable of being machined to close tolerances using standard carbide tooling. When faced with fused silica cement or other suitable mortars. Foam-50 can withstand moderate working face conditions including trough linings for molten aluminum, copper, and other non-ferrous alloys. Standard block size is 4.5″ x 12″ x 18″ (other sizes by request). 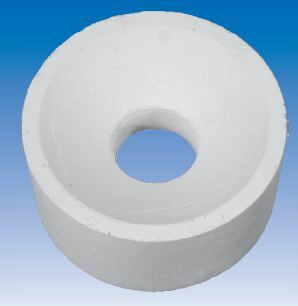 Fused Silica Foam-30 is also available from Foundry Service on a special order basis. Foam -30 is a 30 pcf version of ceramic foam. All mechanical properties were determined at room temperature. These are laboratory results typical of the material and are subject to normal manufacturing variations. They are supplied as a technical service only. The volume stability of insulating Foam-50 allows for production of large shapes which can be used in severe cyclicell nameonditions up to around 2000ºF. Because it’s such a good heat barrier, fuel economy will result from the use of Foam-50 as compared to conventional refractories and castables. The large size capability coupled with thcell namease of fabrication allows for great freedom in engineering ancell nameesign. 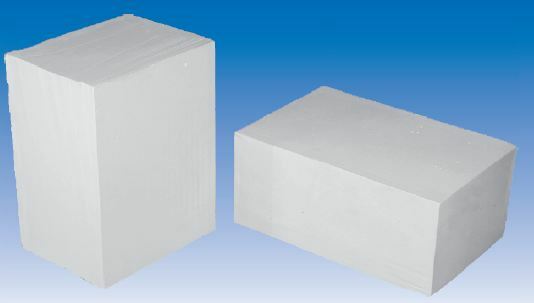 Foam-50 blocks can be easily joined with fused silica cement. The material has high chemical purity, good acid resistance, excellent electrical resistance, and is unaffected by nuclear radiation. Typical applications include furnace door, roof, and wall insulation, aluminum trough liners, reflectors for quartz lamps and infrared heaters, tooling for aerospace and glass forming operations, brazing fixtures, gas uptake liners, and thermal barriers for nuclear applications. Foundry Service is capable of casting, fabricating, and machining Foam-50 to exact customer specifications. Fax or e-mail your requirements today.